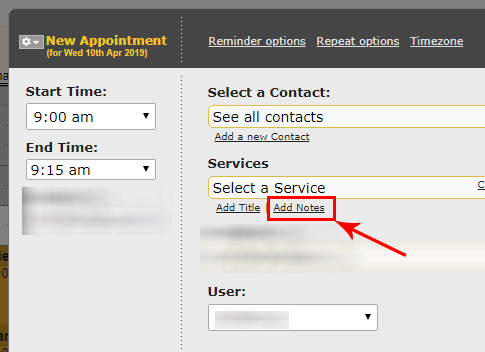 We’ve updated the calendar so you can now see a small tag on appointments that have notes entered. Mousing over these appointments will popup the entered note over the top. This lets you quickly get more content about appointments directly from your calendar view. As a reminder notes can be easily entered when adding or editing appointments using the “Add Notes” option. As usual, please let us know if you’ve any feedback on this powerful new feature. We’ve introduced an upgraded in-app notification system. Notifications can be seen by clicking the new bell icon at the top. The default icon is gray, but when there are new notifications it will appear green and blinking. 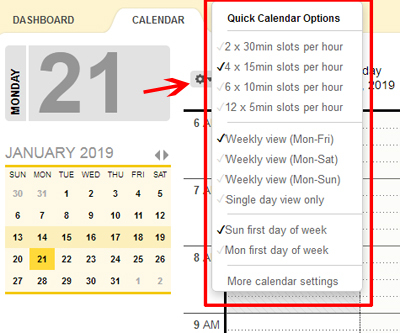 We’ve introduced a quick calendar settings menu available directly from the main calendar page. 1) Changing the slots per hour setting. This controls the amount of detail visible in the calendar by changing the amount of time each slot takes up. 2) Changing the number of days visible per week. 3) A new option to allow switching between Sunday and Monday as the first day of the week. Any changes made immediately update either the large or small calendar views. Feedback on this new feature is much appreciated. Once client payments are enabled in YellowSchedule just swipe the card while in the “contacts” page. It will enter the card details and you’ll just need to enter the 3 or 4 digit CVC code and click save. Not started yet with payments? See how easy it is to use YellowSchedule to begin taking payments from clients https://www.yellowschedule.com/support/enabling-client-payments/. 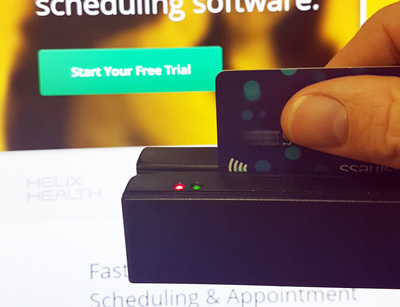 Not sure which card reader to use? Check out this list of cheap card readers on amazon! 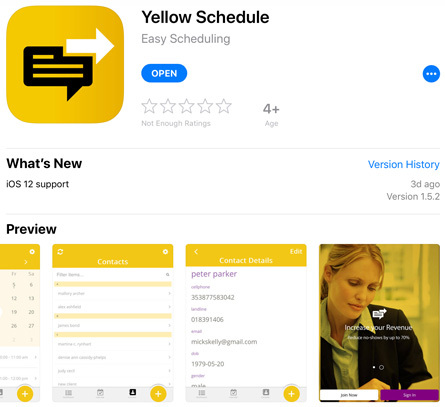 We’ve released a new version of the YellowSchedule user app (1.5.2) for apple devices. This version fixes keyboard and stability problems affecting any devices running the latest version of iOS (12). If you are experiencing any problems we recommend updating the YellowSchedule app version. We now have the ability for users to create contacts on behalf of other users. This is useful for team accounts where there are controls over which users can see specific contacts and where secretarial users may want to create contacts with a specific clinician as the contact “Owner”. To use this new option you must first be configured to have advanced user controls switched on. 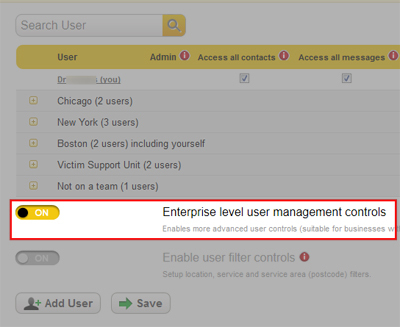 An admin user can switch this on by going to -“Settings” (top right menu) >> -“User Access” >> “Enterprise level user controls”. Instead of deleting contacts that have dropped off, try archiving old contacts instead. This keeps the active contacts that your team needs ready at your fingertips and lets you make active again any old archived contacts if the need later arises. Archiving a contact removes it from the primary display, and dropdown lists and helps keep your YellowSchedule experience fast. We have a small amount of phone numbers that we use to allow our business customers send text message reminders to their clients on. Some of these numbers are 520-413-7474, 647-931-1551, 647-931-4747, 415-992-6511, 804-409-9944. If you have received a reminder text message from one of these numbers and you’ve reached this page after looking up one of these numbers.. well there’s likely no need to worry as they are reminder messages which have been generated on our scheduling system. Often the message will contain an appointment date and time that you have been scheduled for and invite you to reply to it with a “Yes” message to confirm your appointment. If you’ve any further worries you can email us at info@yellowschedule.com.